Even the most somber weekday uniform (picture: grey suit and crisp, white French cuff shirt) can be switched up daily with a new pair of cufflinks to send your style factor through the roof. After all, the more stylish a man becomes, the more he tends to rely on the smaller details to make his look. But with so many options to choose from, maybe you’re finding it difficult to pick that signature pair for day-to-day wear. Never fear – we’ve got a few tips to help you figure out which cufflinks to make into your own and how to match them with your existing wardrobe. So we’ve established that cufflinks can be worn anytime, anywhere. They aren’t just meant for black tie affairs. However, what about the shirts needed to wear cufflinks with? Are they not more appropriate in some situations than others? Cufflinks are an alternative to the buttons sewn onto shirt cuffs – and as you may have noticed, most of your dress shirts come with buttons fully intact. Traditionally, French cuff dress shirts are the ones ready-made for the cufflinks of your choosing – and while many are a clean, crisp white, you can find them in a variety of colors. Cufflinks also always work with a suit-and-tie ensemble, be it at your 9-to-5 job or the networking event afterward. As you first foray into the world of ‘links, you’ll find that there are very (very) many different styles and shapes to choose from. Where to start? Shape: We vote round. After all, if they’re made to look like buttons, it’s tough to go wrong. Material: You may or may not want to drop some cash on gold cufflinks, especially if your collection will remain small. For an affordable alternative, try silver or gold plated. Silver and enamel are a real safe bet for your first pair. Color: There’s no right or wrong answer here. Again, silver and gold are standard and easiest to color coordinate. But we say choose whatever you’ll be most excited to wear! Style: Classic and conservative. It’s hard to argue with those style choices in either professional or casual settings! And trust us, you’ll want a pair that translates. Some have said that as a man, you have to limit your accessories to only one type of metal. Sounds good in theory, but what should you do if you always wear a silver watch and your monk-straps have a gold buckle? Should you go for silver or gold cufflinks? Our answer is easy – mix it up! Why bother trying to coordinate your cufflinks, watch, wedding band, belt buckle AND briefcase closures? Consistency is a nice goal, but at some point, it becomes matching overkill. We say mix ‘em up and just forget about it. So long as your cufflinks are complementary to what you’re wearing (not a complete replication), you are good to go! Guys – sparkle isn’t just for ladies anymore. And no, not that kind of sparkle. We’re talking something a little more sophisticated here. You can easily elevate your look with the addition of a pair of cufflinks encrusted with diamonds or Swarovski crystals. This is an easy way to class up an outfit without making it look totally overdone. 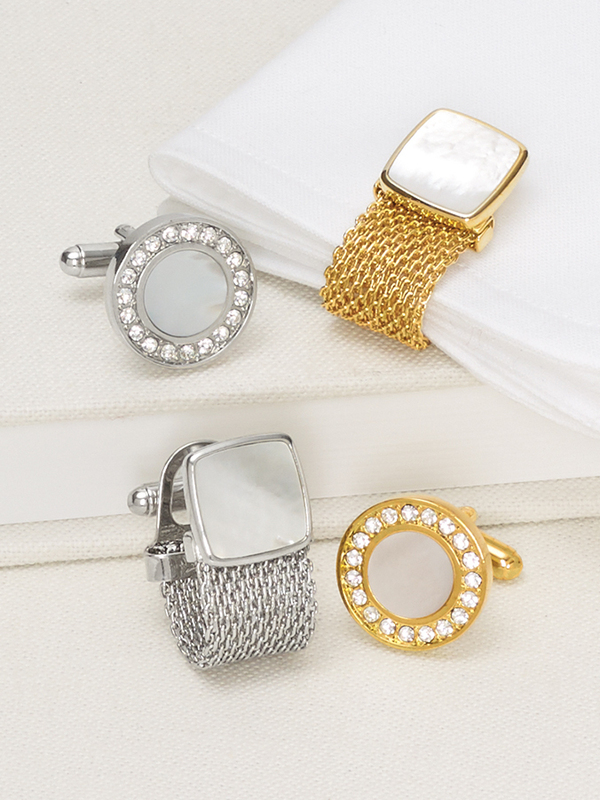 Whatever you do, make sure that your crystal cufflinks are of high quality and don’t look cheap – this is a very quick way to take your outfit down a notch rather than elevating your style. 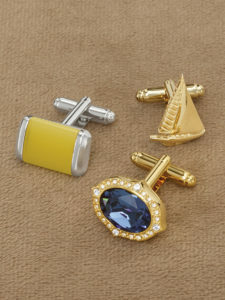 Many guys tend to avoid reaching for colored cufflinks – don’t fall victim to this chain of thought. Colored cufflinks can absolutely be your friend if they are styled in the correct manner and paired with the right pieces. For example, if you’re sporting a suit jacket with a royal blue pocket square, consider adding colored cufflinks to your shirt to add a complementary touch to your look. Whether it’s crystals or enamel filling, coordinating your colors can perfectly pull a look together. Look through your work staples and find a color you might like to highlight. Maybe it’s the primary color of an unconventional blazer, a secondary tone in your necktie or subtle hue in your patterned dress shirt. 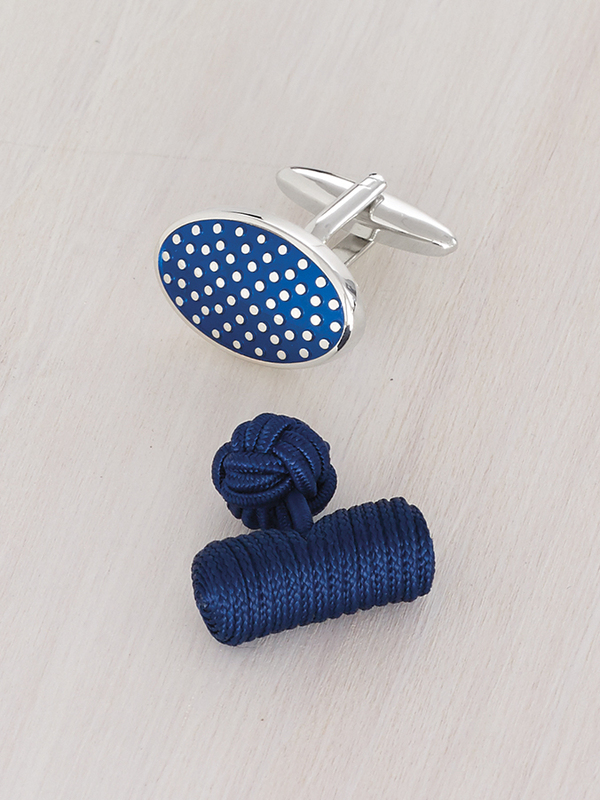 Start there, then choose cufflinks that complement or contrast well with that color. Need some more intel on choosing cufflinks and shirts/ties that complement one another? Check out that blog post here! Just because you’re wearing a suit and tie doesn’t mean that you need to keep your cufflinks all-business, too. Don’t be afraid to switch it up and add something with an eye-catching novelty design to add a little pizazz to your look. Novelty cufflinks are the perfect way to let your personality shine without looking unprofessional or like you aren’t put together. Have we still not convinced you that cufflinks are a staple accessory? We get it. French cuff shirts can be a little uncomfortable or too dressed up for some guys. If that’s you, we have another option you should consider: button covers. These pieces effortlessly slide on over the buttons on any dress shirt cuff, adding extra style to your look without having to wear a French cuff. When wearing button covers, the same rules apply – go for something complementary rather than replicating the all the metals in your look, keep it high quality, and don’t be afraid of adding a little bit of color or novelty to your finished ensemble. 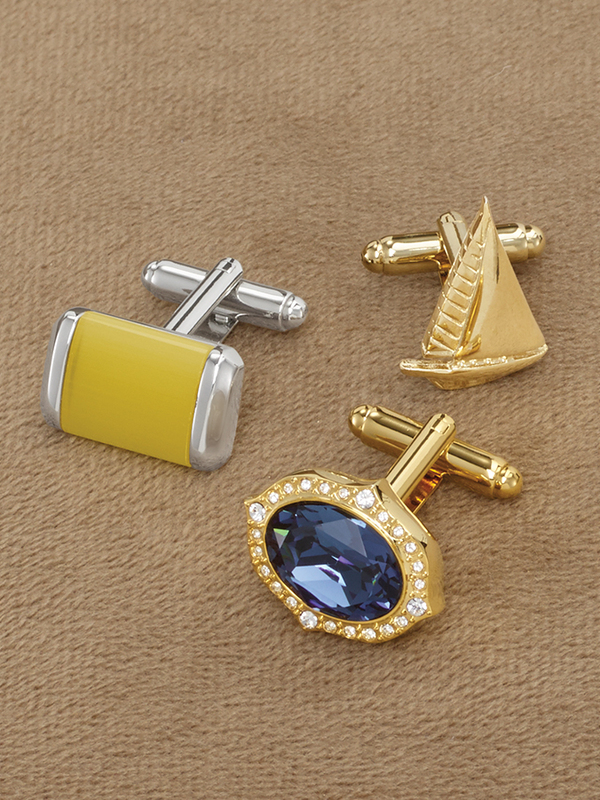 When you’re ready to shop, you’ll find our full selection of cufflinks online here! Editor’s Note: This blog post was updated on May 4, 2018. Hey Michael, thank you for these excellent tips on links & matching them to your shirts and ties etc…. now the biggie,would Paul Fredericks consider offering masculine earrings? I have a small gold “knot” earring that matches my gold knot studs and cufflinks, I always wear it when I wear my tux, and it looks too wonderful! Thank you for your feedback, John! We are glad to hear that you liked the post. I will be sure that your suggestion regarding earrings is forwarded to our Merchandising Department for review. If we can be of any further assistance, please let us know! what a great idea! i would love to pick up a stud or two for my man and he would be impressed that it came from paul fredericks!!! Cufflinks would make a great gift, Kay! You can place an order on our website or by calling us at 1-800-247-1417. Any of our representatives will be happy to assist you. Thanks for the style advice. I inquired as I have Geoffrey Beane Plaid shirt (Plum color) with a white collar. I own a pair of black and white cuff links and wasn’t sure which ones to wear. Thanks for the question Bob! 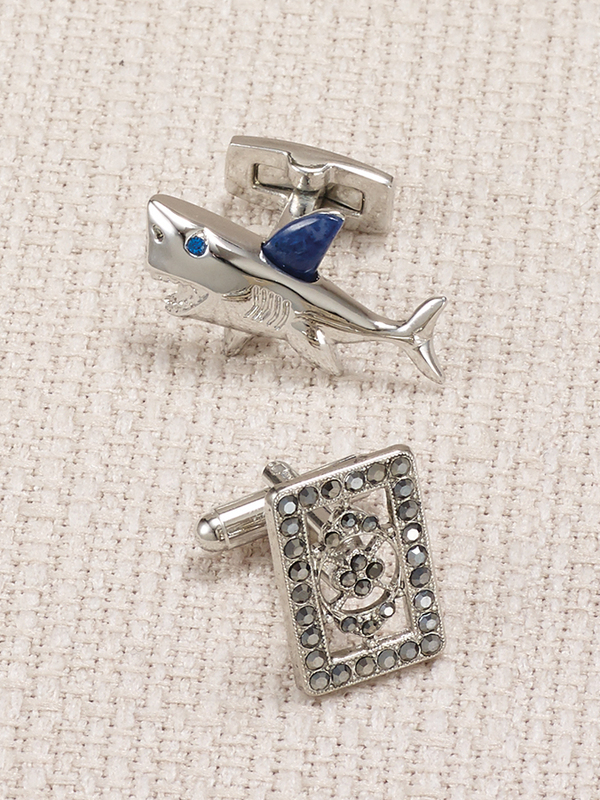 Either pair of cufflinks would definitely work with a plum dress shirt. The white would give you more of a pop, while the black would offer a subtle look.